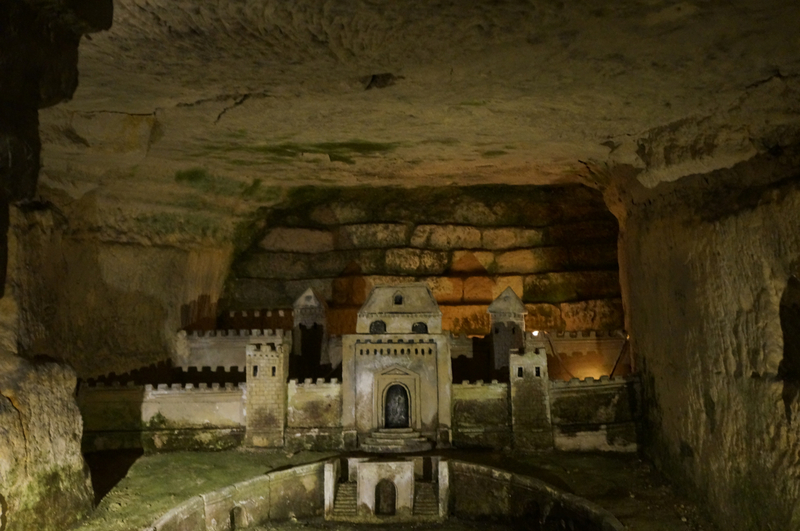 On my first visit to Paris I tried to visit the Catacombs twice. The first time, I made the unfortunate discovery post metro ride that they are closed Mondays. The second I waited in line for 45 minutes, only to get two people away from the front of the line and be told at 3:59 that the ticket counter closes at 4 and no more visitors would be allowed in for the day. On my latest visit to the city I put the Catacombs at the top of my itinerary. I flew into Aeroport Beauvais, an airport that is actually an hour and 15 minutes from the city center. Though my flight landed at 12:20, mass confusion at the airport followed by bus delays and traffic put me at the edge of the city center at 3:15. Determined not to miss out on the Catacombs this time I ran up flights of stairs in the metro and down city streets to arrive at the gates at 3:50 and find that no one was in line, a benefit of visiting in the beginning of December versus August, fewer tourists! Third time is the charm and I’m glad I did. 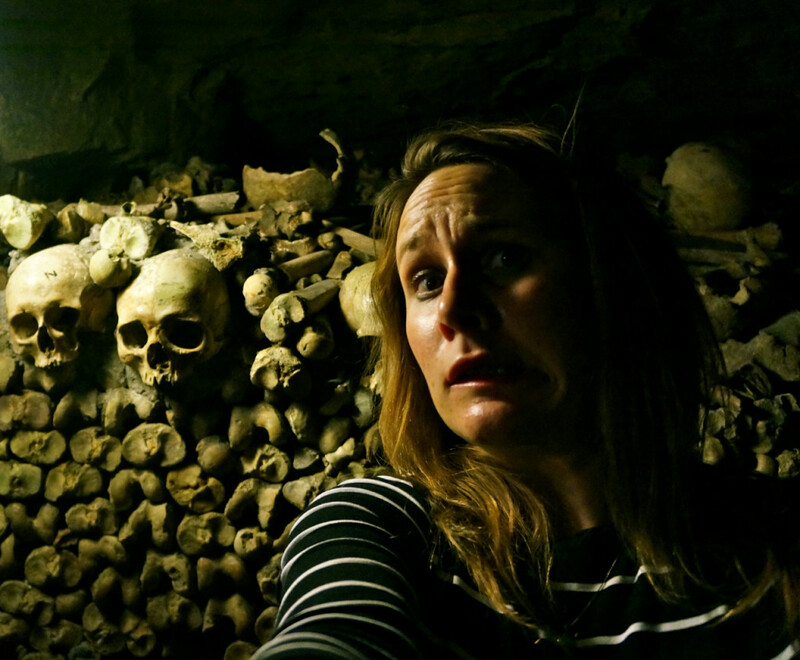 The Catacombs were a spooky treat and I discovered a myriad of surprises in the Catacombs of Paris. 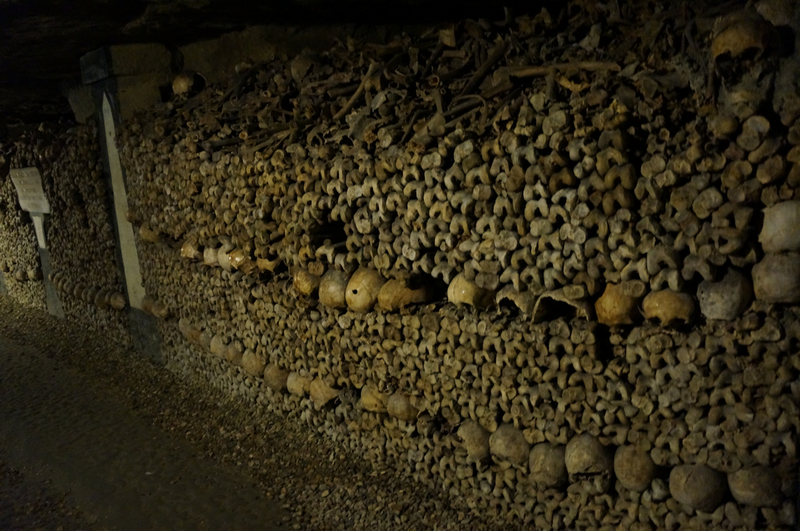 The Catacombs are an underground ossuary, or resting place for human bones. 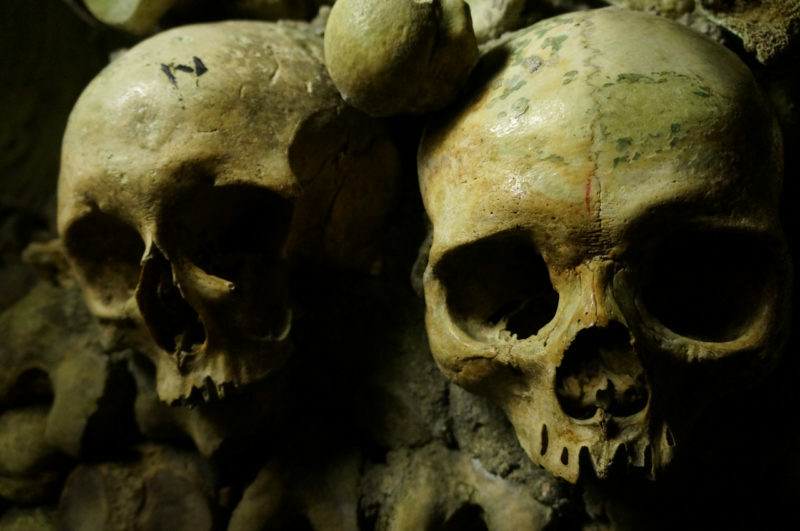 The skeletal remains of six million people lay below the streets of the 14th Arrondissement of Paris. As disease ran rampant in the late eighteenth to mid-nineteenth centuries, above ground cemeteries were closed because of their impending health risks. Human remains were moved below ground. With existing passageways and empty space, the former stone quarries used to build the capital city proved the perfect place to relocate bones. 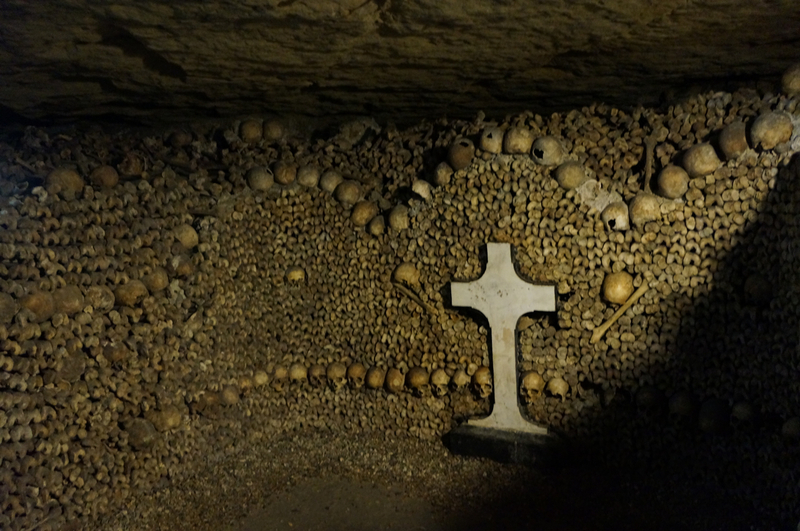 The Catacombs received its first and largest amount of remains from the closure of the cimetière des Innocents graveyard in 1786. The last transfer of bones occurred in 1859. I suppose, if you really think about it, it’s rather morbid that people today, myself included, would pay to wander through a dark maze of human bones. Well, we didn’t start the fire. The first visitor, the Count of Artois, paid a visit in 1787, and sporadic public visits began after a renovation in 1815. Public visitors have been allowed regular visits since 1867, and the Catacombs were one of the most popular tourist attractions during the 1900 World’s Fair. As I explored the Catacombs solo on a late December afternoon, my fortune of being the only visitor in line revealed a spookier side as I wandered through dark, winding passageways lined with bones. It’s quite creepy down there, and, though there were a handful of other tourists exploring with me, at times I was alone next to the skeletons. The ground is lined with gravel that creeks as you walk, echoing in an eerie manner that makes it seem as if you are being followed. There are dripping pipes and the only sign of modernity are the lights, so dim they could be torchlight if you use your imagination. Around one twisted bend a man knelt low to the ground photographing a skull. I didn’t see him at first and when he adjusted his stance the gravel rolled and I let out a scream. It takes a while to get to the actual bones, though. 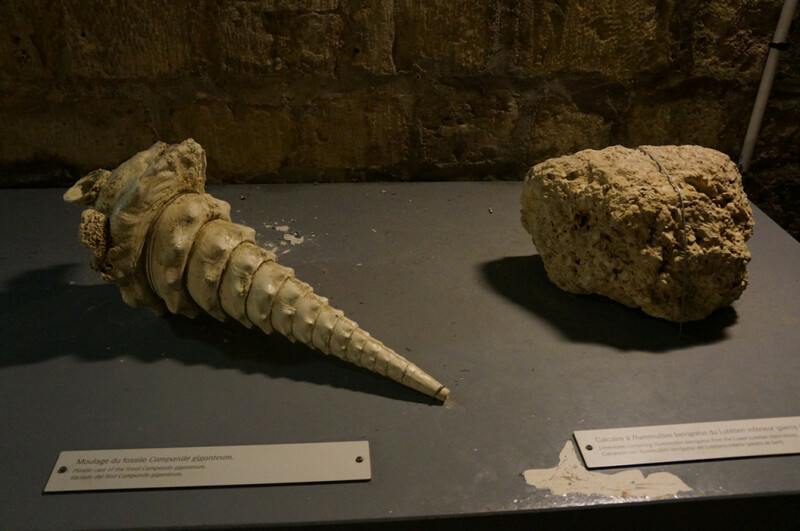 First you walk through empty passageways before arriving at a series of exhibits on the geological history of Paris and the stone quarries that formerly housed the space. (Boring! Can we just get to the bones, please?). There are also several castles carved into the stones along the walk. Wander through more empty passageways that make you feel as if you are on the set of Les Miserables, an extra in some deleted scene that didn’t make it into the final film. Then all of a sudden, there they are: rows, and rows and rows of bones and monuments that pay homage to the deceased. 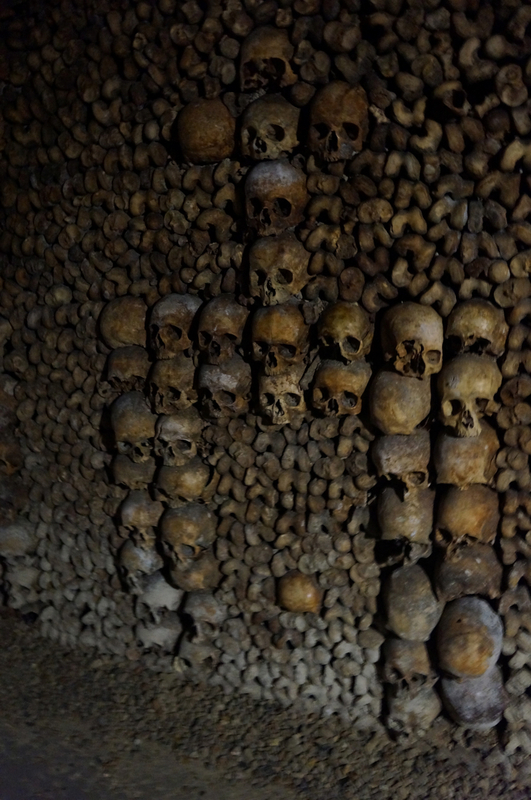 It takes about 45 minutes to walk through the Catacombs in total, and flash photography is not permitted. It’s spooky. It’s creepy. It’s amazing. Definitely visit the Catacombs during a trip to Paris.